"The fighters escorting the patients have now overrun the hospital. They are from the northern part of the country. They don't know us and they are better trained than the local militias, but they don't have any greater respect for us." 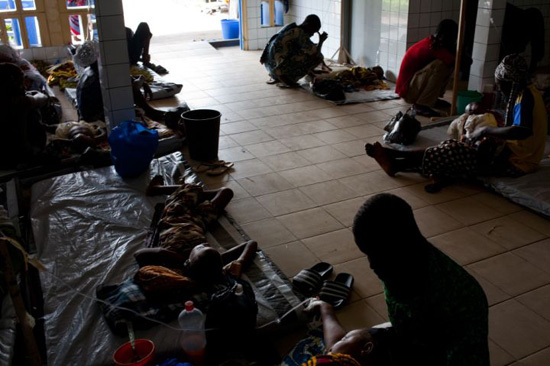 An overflow of patients due the post-election violence in Abidjan meant that some people receiving care at the MSF-supported Abobo Sud Hospital had to recover on the floor. During a week of intense violence that preceded the arrest of former Ivory Coast president Laurent Gbagbo on April 11, a Doctors Without Borders/Médecins Sans Frontières (MSF) team working at the Abobo Sud Hospital in northern Abidjan was isolated and unable to obtain additional supplies from the outside. Delphine Chedorge, coordinator of the MSF team in Abobo Sud, kept a diary in which she describes the teams' daily life during this tense period. Some information and facts have been changed or deleted in the interest of security, confidentiality, and comprehension, but the essence of her diary is presented below. Groups mentioned are: Forces Nouvelles—Ivorian rebel forces; the United Nations Operation in Ivory Coast (UNOCI); and the French "Operation Licorne" forces, which are supporting the UN peacekeepers. Her entries, minimally abridged and edited, illustrate some of the dilemmas and difficulties the team experienced, recounting, for example, how the team had to rely on armed forces in order to move—an extremely unusual measure for MSF—and how they had to hide the wounded. The Forces Nouvelles' final offensive began around noon. The U.N. authorized the French Licorne forces to attack Gbagbo's heavy weaponry, which had caused civilian injuries and was also used to attack the UNOCI. All afternoon, fighting was concentrated around Cocody and Angre, targeting the Ivorian national television network. We could hear it very clearly from our location in Abobo. It's not far away and sometimes the noise came quite close. The sounds make it possible to identify the exact location of the fighting. We can also hear sporadic firing around the hospital. Fighting continued all night, until Tuesday morning. The fighters were the only ones to bring wounded patients in—arriving in a steady stream. However, we think many of the wounded are not reaching any medical facility unless they are transported by Forces Nouvelles soldiers. The fighters escorting the patients have now overrun the hospital. They are from the northern part of the country. They don't know us and they are better trained than the local militias, but they don't have any greater respect for us. They are armed and come and go freely in the units, the emergency department, and the screening area, and even try to take our food, saying they need it because they're fighting. These never-ending daily discussions—intended to make sure the team is safe and that it can do its work—are exhausting. The prognosis for our anesthesia supplies: two days, maximum. Gbagbo's surrender was announced this afternoon. Cheers in Abobo, people firing into the air everywhere. Everyone is hiding in the hospital—a bullet flew through the doorway and others are exploding on the roof. Injured patients follow quickly. Fighters arrive with the wounded. One man shows up in handcuffs. He was taken when Gbagbo's second wife's house was attacked. He was visiting his brother, who worked there, and was beaten and stabbed. He is terrorized, but his wounds are not serious. The fighters didn't have the keys to the handcuffs. When they left, we cut the chain with shears.The two cuffs are still there and we hid them under bandages. Unfortunately, we had to set him up in the hallway on a plastic tarp for the night. Other patients and their escorts in the hospital rooms insulted him and threatened to kill him. We decided to move him somewhere else while he was being treated. The Licorne forces promised us a convoy so that we could get the medicine and supplies that have been stuck in MSF’s coordination space in Zone 4 [Ed. note: southern Abidjan] with our two operating room nurses. They are going crazy, stuck there like that. Gbagbo withdrew his surrender, saying that there had never been any question of doing anything like that. The situation is falling apart. Since this morning, we've been hearing about lots of bodies abandoned along the side of the road—wounded and sick people who couldn't manage to get to medical facilities. Some areas of Abidjan lack electricity and even drinking water. There's not enough food. In short, it's about as bad as it can be. Our two operating room nurses and the convoy of supplies that the Licorne forces promised have not arrived. Nine wounded and 67 patients hospitalized today. Some of the wounded have returned to the operating room. Two of them had to have limbs amputated because the staff is so overworked and there are so many life-threatening emergencies. The surgical team is really upset. Phrase of the day: “nothing like a good friend to shoot at you” (as a large share of our wounded patients have been shot by friends). Patients are showing up with their prescriptions for antiretrovirals and tuberculosis drugs. We're starting to take care of them. In the end, the Licorne forces canceled the convoy. The Japanese embassy was attacked last night and the Licorne soldiers had to get seven people out. Two pick-up trucks were also attacked at the French embassy. Our team based in Zone 4 left to come join us but they did an about-face when they came face-to-face with snipers and burned-out shells of cars in Adjame. We're hearing increasing numbers of accounts about bodies left in the street. No one is picking them up. Our MSF team is still not leaving the hospital, although a few more people are out in the street this morning. Nine wounded today, 75 hospitalized. There's still a patient who needs an amputation. A little truck arrived from Bouaké with the anesthesia kit and solutions. Unfortunately, there are no narcotics inside (no valium or morphine) and only 10 vials of lidocaine. That's one day's supply. Our surgeon just learned that his family may have been robbed again… He's afraid and can't get through on the phone, so he borrowed mine to check on security where his wife lives. I sent a car of fighters to buy some baby formula and diapers for a baby who was abandoned at the hospital in late March. There are no more rules here. MSF's standard principles no longer apply. We're just trying to treat our patients, almost any way we can. At the end of March, we were comparing Abobo to Baghdad. Today, Abidjan resembles Mogadishu—chaos, multiple groups, clans, robberies. Terror and catastrophe for the people who live here. We are not seeing any light at the end of this tunnel and the stories people are telling us are worse and worse. Salha, our head of mission, sent us a text this morning, telling us to hold on. The message included a little wink: "Don't forget—the Licornes do not exist." [Ed. note: Licornes means unicorns in French] However, it seems they carried out around 600 rescue operations in Abidjan yesterday. The market is a little more crowded and there's a bit more variety, too (but nothing to get excited about). Abobo is the best-supplied neighborhood in Abidjan.The hospital pharmacist has returned. The electricity and air conditioning are back on in the pharmacy and we're organizing things so that we can set up our pharmacy in there, too, freeing up the large recovery room that we've taken over. A steady stream of people with bullet wounds continues to arrive. Labor and delivery is working at full steam. We are also seeing a regular flow of ill people:wasting syndrome, end of life, chronic illnesses in a complete state of collapse that we can't do anything about (including HIV, diabetic coma, and stroke). There's malaria, too, which, fortunately, we can still treat. Deaths, explanations to the families so that they can take their parent home. That's hard, too. We don't have an experienced doctor, either (our young physician is working all alone and pretty much lacking support, in spite of the supervising nurse who helps him a lot). Five deaths today, 29 admissions, including 20 bullet wounds. The total number of hospitalized patients is now 78. No more 450 ml blood bags (we have only 250s left); only two more Determine HIV tests (we've been out of the Unigold for several days); no adrenaline; still no more valium or morphine; two boxes of examination gloves; no more tramadol; no more Ace Bandages; no traction materials. The market is bigger and there are more goods. This is our first outing—to the market and Anyama Hospital [Ed. note: the Anyama neighborhood is also in northern Abidjan]. There are roadblocks every few hundred yards, but the guards are not hostile. Everyone greets us. At the hospital, the bursar tells us that the market reopened 24 hours ago. Not many roadblocks. Life is almost normal. On the other hand, the hospital is deserted. There are seven medical staff, compared to the normal 157. Finally, four trucks with medicine and medical supplies have arrived! And the first MSF employees who will be working at Anyama Hospital, too. Another car arrives at our house in Abobo with supplies and our two international staff. We leave to visit Anyama Hospital, escorted by two 4x4 vehicles. Next, we'll go to the two large clinics to get them started again. One of them is ideal for outpatient visits; the second is too far from the main road and the poor roadway conditions make it difficult to refer patients. We got back at night. Tomorrow, the team will go to Anyama Hospital to set up logistics and start calling the hospital staff back to work. In Abobo Sud, we can hear light and heavy weapons fire again in the late afternoon. It's not very far away. By the end of the evening, we had taken in only four seriously wounded patients. At that point, we didn't know that the big numbers would arrive at night. At least we were completely ready.